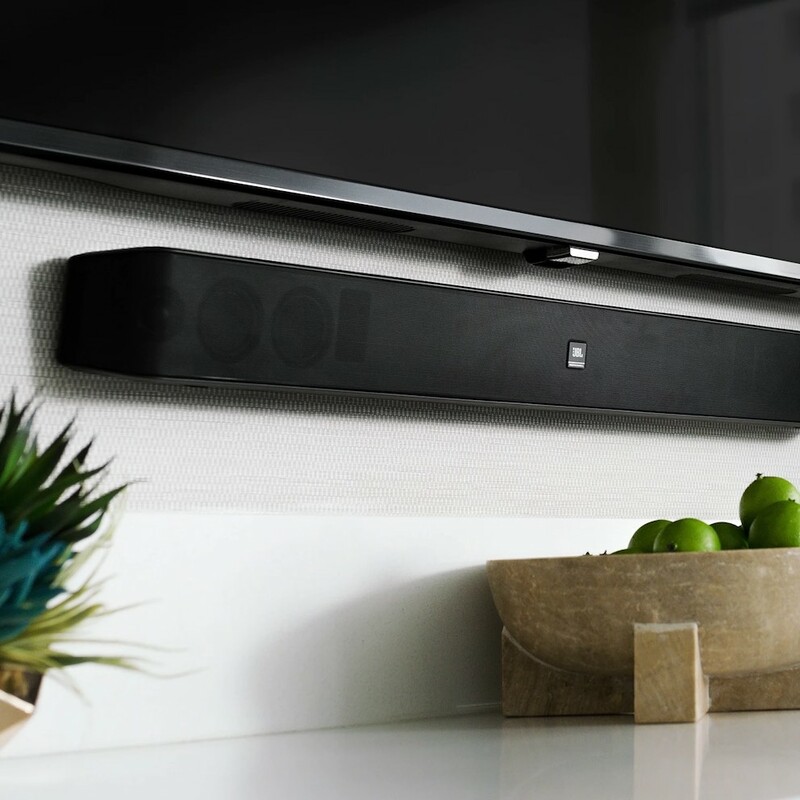 Born out of the same stable as JBL’s multichannel Bar 5.1, the Bar Studio is a basic, subwoofer-free, two-channel soundbar aimed TVs with screens that are 28 inches or larger. Looks-wise, it’s very similar to Bar 5.1, featuring the same grille, chassis and top mounted controls. At just 61cm wide, it’s about right for smaller screens (28″) but will also be perfectly at home paired with screens up to 55″. Its slim form-factor means that finding it a space in front of your TV isn’t difficult either. Both channels have a 2″ woofer and 1.5″ tweeter. It is also said to be able to crank out 30W of power. 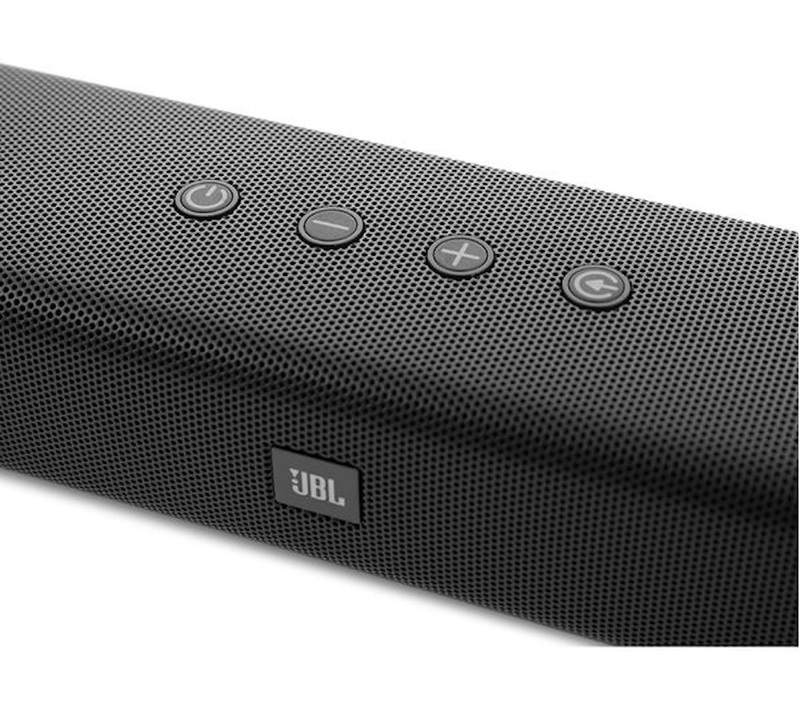 While it won’t shake your house off its foundations, its frequency response goes as low as 60Hz, and I was pleasantly surprised at its LFE output. Getting it connected wasn’t that hard thanks to the plethora of connections, including SPDIF optical jack, a 3.5mm jack, USB, Bluetooth and HDMI ARC, available. There are no HDMI inputs for external sources, but given its very reasonable sticker price, we can forgive that. A remote is bundled, but its design appears to be a bit of an afterthought. All the buttons are the same size, and although it gives the volume and bass keys a glossier finish, I found myself looking at it before using it, which was a bit of an unneeded distraction. I was also interested to note that there is a “surround” mode, which when fired up, gave me a bit of a start thanks to a piercing “beep” sound. Once I’d collected myself off of my TV room ceiling, I was pleasantly surprised. Faux surround effects are a dime a dozen and usually poorly done, but the Bar Studio did deliver a noticeably expanded soundstage – its audio was also pleasingly natural instead of being a reverbed exercise in phase distortion. The Movie pre-set however seemed much less about the width of the sound and more about delivering loud FX track audio. For action movies such as Terminator it was just the thing, but having it enabled while sitting through an episode MasterChef, I found myself becoming increasingly fatigued as the show’s god-awful FX music (put there to denote faux drama in an otherwise vapid mess of nothingness) blared at me. All told, audio presentation impressed. While it won’t deliver the sonic goods of a decent 5.1 setup and lacks similar audio scale, it also costs a fraction of the price of an AV receiver and decent 5.1 speakers. Audio from the Bar Studio felt well-projected. I particularly liked how cleanly it delivered dialogue – hard to decode Scots or northern accents in Shetland, or Happy Valley was crisp and concise, and this enhanced my viewing experience. 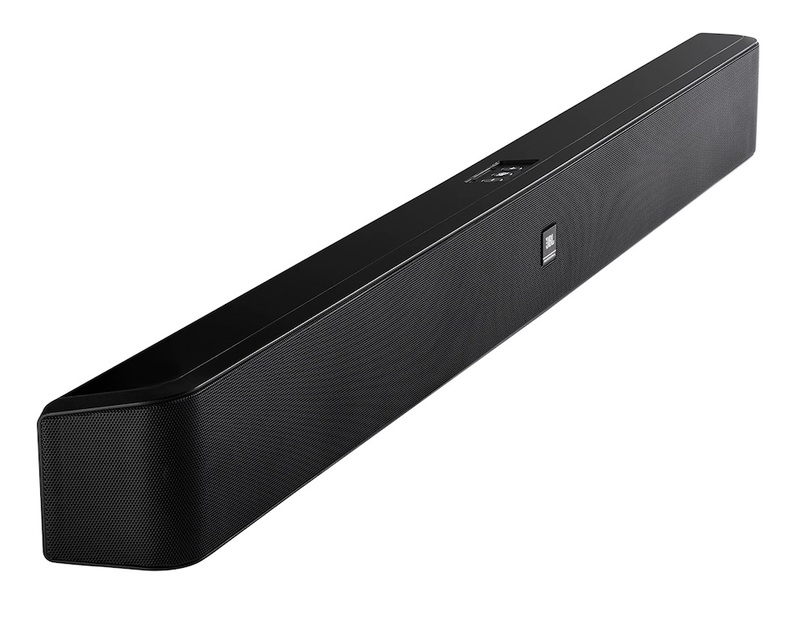 I was also pleasantly surprised at the LFE sound the soundbar could crank out. While it will never match the gut-shaking rumble of my Theophany sub, there was some rumble in the jungle when I played Alien Vs. Predator. Musically, it did better than I’d expected. Where most soundbars deliver mushed music that makes it hard to pick out detail, there was good sonic separation and a surprisingly detailed sound-stage when playing the SACD version of Dark Side Of The Moon. About the only noticeable defect was in the upper mids and lower treble which felt a bit shrill at higher volumes. If you’re in a situation where a multi-channel audio setup isn’t practical, or financially out of reach, yet the crappy inbuilt speakers of your TV are driving you mad, the Bar Studio is a reliable and affordable solution that’ll offer your ears a pleasant surprise.